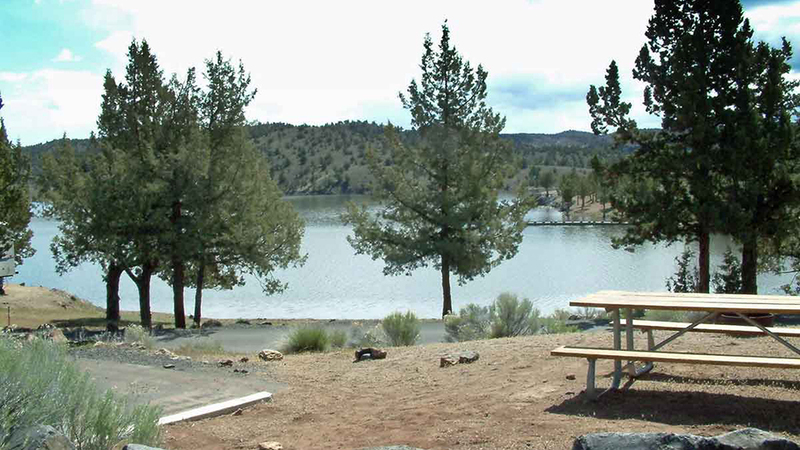 Jasper Point campground is one of two developed campgrounds at Prineville Reservoir State Park. It has 27 first-come, first-served campsites with electricity and water hook ups. The lake is just a short walk from the campsites, with some having water front views. There are flush toilets and hot showers available. An RV dump station is on site. The park also has a two-lane boat ramp and courtesy dock for boat access to the lake. A trail head for hiking into the State Wildlife area is located inside the camp. There is also a 1 ¾ mile hiking trail that will take you to the main campground. Jasper Point campground is open for camping May through September, but it offers year-round fishing and wildlife viewing. The reservoir is located in a deep desert canyon, and the area is very quiet. There are some trees for shade and fairly generous spacing between sites.